John Lewis' decision signifies yet another victory for the growing Boycott, Divestment and Sanctions (BDS) movement. Consumers are refusing to buy goods from companies profiting from Israel's illegal occupation. John Lewis' Managing Director, Andy Street, wrote to the Palestine Solidarity Campaign in a letter dated 7 January: "As a socially responsible retailer, John Lewis takes very seriously the treatment of workers and their working conditions. We expect all our suppliers not only to obey the law, but also to respect the rights, interests and well-being of their employees, their communities and the environment." He ended by stating: "In relation to your specific enquiry about Ahava Dead Sea products, I can confirm that John Lewis has ceased stocking these particular products". "PSC welcomes John Lewis' decision to stop stocking Ahava products. Israel's continued attacks on the Palestinian population - whether living under a brutal blockade in Gaza, under illegal occupation in the West Bank and East Jerusalem, or under constant assault inside Israel, has led to a seismic shift in public opinion, with the movement for peace and justice for Palestinians gaining massive support internationally. Ahava Dead Sea Laboratories, an Israeli cosmetics company, has its manufacturing plant and visitors' centre based in the illegal Israeli settlement of Mitzpe Shalem in the West Bank. The company is 44 per cent owned by Mitzpe Shalem and another settlement, Kalia, so Ahava’s profits subsidise these illegal colonies. Ahava’s manufacturing plant is in an illegal Israeli settlement, on stolen Palestinian land. Its beauty products can’t conceal the role Ahava plays in Israel’s dirty occupation. Ahava, and other companies profiting from Israel’s illegal occupation, are being sent a clear message by consumers who are refusing to buy their products. Although governments, including our own, are failing to end Israel’s violations of international law and human rights, we can all take action by refusing to buy Israeli goods and joining the movement for BDS. The PSC will continue to ensure that companies which profit from Israel’s occupation pay the price for their complicity in Israel's crimes. In Canada, The Bay has confirmed that it had discontinued sales of Ahava products with their CEO Bonnie Brooks saying on 13 January 2011: the Hudson’s Bay Company (HBC) discontinued sales of AHAVA beauty products, primarily because of sales results which had been declining for several years. It acknowledged that although this decision was made by HBC solely for commercial reasons, it occurred at the same time as an aggressive campaign by several groups advocating a boycott of AHAVA products. 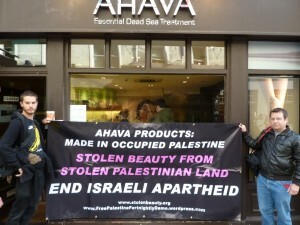 US group CODEPINK also campaigns against Ahava, operating the stolenbeauty.org website.